A bunch of rag-tag soldiers, a sniper, a scientist and a young boy do battle against the predators who are back on Earth. Shane Black is back, but this time behind both the typewriter and cameras as he goes from starring in the original Predator movie to writing and directing this 2018 version. A predator crashes on Earth trying to bring mankind a present. Another, much larger, predator is sent to prevent the present from being delivered and caught in the middle are Quinn, Body Holbrook (“Logan“, “A Walk Among The Tombstones”), and his son Rory, Jacob Tremblay (“Wonder”, “Shut In”). They meet up with a scientist, Olivia Munn (“The Newsroom (TV)”, “X-Men: Apocalypse”), and a bunch of soldiers, with a wide range of issues, including Trevante Rhodes (“Moonlight”, “12 Strong”), Keegan-Michael Key (“Tomorrowland”, “Let’s Be Cops”), Thomas Jane (“The Expanse (TV)”, “Thin Red Line”), Alfie Allen (“John Wick”, “Game Of Thrones (TV)”) and Augusto Aguilera (“Chasing Life (TV)”, “8”), to take on the big predator before it destroys mankind. This, of course, is not the first thing Shane Black has both written and directed since starring in the original Predator movie. In fact, around the same time he was starring in Predator he was writing Lethal Weapon. He also wrote and directed Kiss Kiss Bang Bang, Iron Man 3 and The Nice Guys to name a few. His movies are filled with humour, they have a certain style to them, a swagger almost, and in Iron Man 3, he’s picked up the mantle of long-running franchises before. With The Predator (notice the “the” at the front”), Black gives us an 80’s style action film and makes no apologies for it. The grunts all swear, a lot, and each has their own back story, specialism and ‘thing’, be that tourettes, being weird or being crazy, particularly the latter. It’s so filled with testosterone and manliness that I thought the scene at the end was going to see Arnie himself emerge. There’s guns and alien-tech gadgets galore and Quinn’s son, Rory, is the boy on the autistic spectrum (something Tremblay does very well but is already in danger of being type cast despite his young years) who can decode the alien tech, ahead of the scientists. The film will remind you of a lot; from the original Predator to the A-Team (the series, not the film) and even Midnight Special at times, but it’s bigger and bolder than all of those with all the depth of leaflet on model railways. This isn’t Black’s best film, it’s not the best Predator film, but it feels less restrained than a lot of the films that come out of Hollywood recently. There’s blood and guts and guns and ‘splosions and swearing galore. We don’t get Black’s usual band of humour though, that much is restrained, and the film suffers for it. Whilst Predator was cheesy, it never set itself out to be funny. Black and writing partner Fred Dekker (“Star Trek: Enterprise (TV)”, “RoboCop 3”) never quite find the middle ground meaning whilst you might laugh at times, it doesn’t do the film any favours as it feels misplaced somehow. 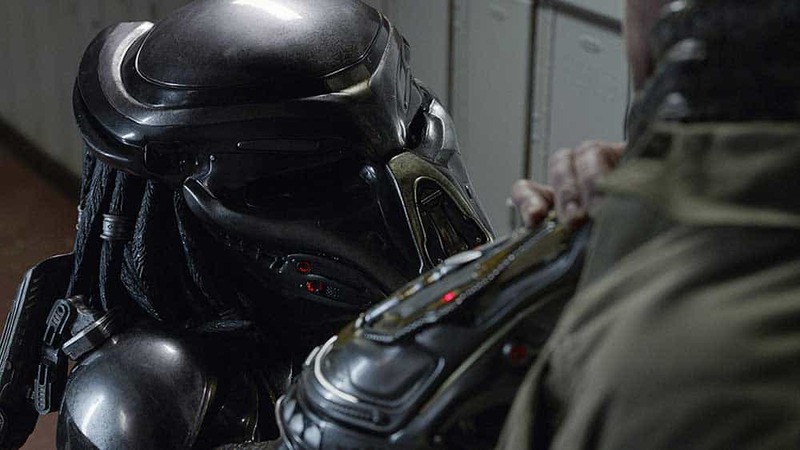 The Predator does what you’d expect a Predator film to do; it provides aliens, men with guns, gadgets and people getting ripped apart in familiar ways. Fans of Black, myself included, may have expected more, sadly, we don’t get it, we just get a Predator movie.